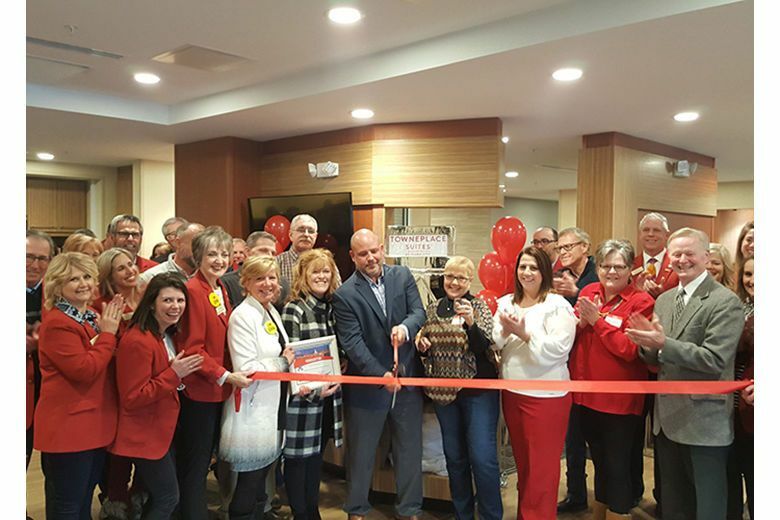 Kinseth Hospitality Company (KHC) is pleased to announce the official Ribbon Cutting and Grand Opening Celebration of the TownePlace Suites by Marriott® hotel in Dubuque, Iowa. The grand opening ceremony for the TownePlace Suites by Marriott®, located at 1151 Washington Street, took place on Thursday, February 7, 2019, with nearly 130 guests in attendance. To kick-off the event, Molly Grover, Dubuque Area Chamber of Commerce President and CEO; Rick Dickinson, Greater Dubuque Development Corp President and CEO; Roy D. Buol, Mayor of Dubuque; and Rob Wartella, Kinseth Hospitality; shared their excitement about the new TownePlace Suites hotel. TownePlace Suites by Marriott® is an extended-stay hotel where you can balance work and life as you like with the comfort, flexibility and affordability you require. Relax and feel at home with a fully equipped kitchen, high-speed Internet access, Container Store closet system, and laundry facility. Maintain healthy living with our Get Fit center, and a wide variety of options on our breakfast buffet. Our TowneMap will help you become an area expert and enjoy everything Dubuque has to offer. Get a breath of fresh air in our exterior lounge area, cozy up by the fire pit, or quickly become a grill master in our exclusive Weber grilling station. Let our friendly, knowledgeable and experienced staff help make your stay a memorable one. These suites are built for the extended stay traveler who appreciates independence and the space for a relaxed and productive stay. Guests have come to know us by our modern spacious suites with full kitchens, free Wi-Fi, free breakfast and friendly staff who deliver a warm “hello” when you walk through the door. Guests will also receive complimentary hot breakfast, free Wi-Fi, and access to the business center, fitness center, indoor pool, and outdoor patio and grill area! For more information, visit towneplacesuites.marriott.com. Kinseth Hospitality is a leading hotel management, development and ownership company. KHC has a proven track record of developing and operating award-winning hotels, restaurant and meeting facilities. Kinseth Hospitality is based in North Liberty, Iowa and currently operates over 70 hotels and 5 branded restaurants in 11 states.